Hi there! I really hope this is the proper place for this post. If not, please be kind, as I have tried to post properly. My wife and I are fairly new homeowners (8 months). As you see in the photo, our backyard is not the prettiest. In the middle of the yard, there is a huge gap where the previous homeowners had a playhouse for their daughters. I am trying to figure out what to do with our yard to make it look nicer. I have considered removing the honeysuckle on the back left and then making a nicer looking wood pile holder to place back there, but once the leaves grow back, all of the trees/honeysuckle provide a nice wall of green along our back fence. We literally aren't able to see through it to the yards behind ours...so that is nice. but I still feel like there is much we can do to improve this back here. Any ideas? Open to any and all. I am really having trouble envisioning anything back here. Should we plant something where the playhouse was? I don't know. Welcome to the forum. It is actually a nice big back yard. It would be easier for us to get an idea of what will work there if you add your zone and location to your profile. 1. Since you are a new homeowner, don't rush. Take out what you don't want, but get a feel for how the yard changes throughout the year so you know what is in the light or shade for most of the year. 3. How to make it pretty? a. How are you going to view it? From a window or a deck. Take some pictures from the spot where you are most likely going to be looking at the space. The design should be pleasing to you from those vantage points. b . How much time do you want to spend maintaining it? Maintenance is important to consider. Everything requires maintenance. Grass will have to be mowed every couple of weeks, shrubs and trees pruned. Perennials divided, annuals and vegetables planted and weeding all of the time. c. Take a look around your neighborhood. See if you like anything your neighbors are growing. If they can grow it well, it will likely grow well in your yard too. d. Decide what style you like. Formal or informal. Do you want just things to plant around the borders with grass in the middle or do you want less grass and more flowering plants, more like a meadow or island beds. e. What are you favorite colors and plants? just a few and plant them in drifts and groups of the same color rather than a mix of colors which look a bit more chaotic. g. If you want something of interest at different times of the year, you also need to consider planting for color throughout the year. You can get blue bulbs blooming in the spring, followed by yellow and orange annuals, and a few evergreens to anchor the garden throughout the year. Remember, you can always use an eraser on paper or on the computer so take your time to do the research and plan things out. It can be cost effective to have a master plan and a general sense of the entire project, but you can install it in increments as you have the time and money to do it. The master plan will help guide you on planning which project to do first and remember plans can change so keep it flexible. Measure everything out. You will find that your project will take more space or you need fewer plants than you thought if you know the exact square footage of the space you have and the plant spacing that will be needed at maturity. It keeps you from buying more plants than you need and a grid drawing will give you a more realistic idea of what will fit. Keep a project book of plants, landscape pictures and ideas you like. You can incorporate some of the plants, or concepts in your design and it doesn't cost that much to dream. Thank you for the well thought out reply! This is very helpful. We are in the southwest corner of Ohio. I will add that to my profile shortly. Imafan gave you great advice. Take your time and PLAN. I had a landscaping business for 10 years. A large portion of my business was ripping out and re-doing poorly planned landscaping. The home owners spent MUCH more money having me re-do their landscaping than if they had hired me to begin with. This is not to say that you can not DIY your yard if you are willing to spend the time educating yourself on plants that do well in your area and spend time planning (scale drawings). For planning I suggest an 18"x24" pad of 1/4" scale graph paper, an architect's rule (triangular shaped ruler with different scales) and a plant template. I have several plant templates and have not shopped for one in a while. They used to be available from Office Depot. Recently a friend told me that they were not available at our local store. They can be found at university book stores and of course on line. You also need a tape measure long enough to reach all parts of your yard and a compass. You need to be able to annotate compass points. Start with a base plan. That is a scale drawing that shows where everything is in your yard- existing plants, fencing, wood pile. Include the back of your house. You need to locate water and electric sources. Imafan made a good point - it is difficult for the forum members to really help you without more information on your local. Pictures of the back of your house would also be helpful. The questions Imafan suggested that you ask yourself are the questions I always asked my clients. Your master plan can be ambitious. Just plan on implementing your vision in stages. I agree very much with starting by thinking about what you want to do in your yard, how you would like it to function for you. I would add as options compost pile area, patio/gazebo/pergola or other shady sitting area, outdoor eating area (do you have a deck that just wasn't in the picture?) We love our big deck and have most of our meals out there when weather permits. It is also great space for growing stuff in pots. Also, I think every garden needs a water feature, whether it is a small bird bath or a little fountain or a pond. For such a flat space think about some elevation change, like a berm or raised beds that are a little extra deep. Think about fence line plantings, remembering that just because the fence is a straight line doesn't mean that planting beds along it need to be. Start by drawing out your plan as people suggested, with where you want things to be. Add all the hardscape first -- paths, patio and / or deck, shed, water feature, anything built. After all the hardscape is in, you will be able to see a lot better what you want to do with the rest. Just for starters -- if this is your immediate view and the woodpile seems unsightly right now, there's no reason you need to keep it where it is. Why not put stuff like that to the side, out of line of sight? If you have the invasive honeysuckle variety then you need to get rid of it. There are other less invasive shrubs you can use to replace them. Don't plant Nandina as a replacement, the berries are toxic. Viburnums are a better alternative. Other than cleaning up weedy and messy areas, try to live with it for a year to see what is already growing there. My first year here I found so many wildflowers and naturalized bulbs. There was a dogwood in the wooded area that I moved to a sunnier spot and a very nice strawberry patch. Check where the sunny areas are so you can plan where to put a garden if you want one. In the meantime you can plant in pots and tubs. Spend your time plotting out zones for different activities. Although I would set up a compost area right away so you'll have someplace to put your leaves and other yard debris. Watch for low areas/flood zones. Also make sure you know where the actual property lines are. You don't want to get in a property line dispute years down the road. Is that low lying green strip a drainage ditch? If so I would plant some wetland plants along each side, leaving a place in the middle for a path or bridge going over the ditch. I would probably put in some sort of water feature like a pond or fountain on the far side right of the ditch. I can see a shade garden full of naturalized bulbs and, as the season progresses, lovely tall hostas and ferns. That is the back half on the right. Then in front of that, close to the house, there would be a mulched area with a table and chairs to set in the yard and watch fireflies and relax in the evenings. On the left would be some sort of trellis/screening with flowers growing with the woodpile and compost pile in front of that. Then going toward the house on the left I would put in some flowering shrubs with flower beds in front of that. But to give good suggestions I would have to know what you want from the area and what kind of plantings you like. Do you like spending time outdoors? Do you want to attract wildlife? What kinds of wildlife do you like? Are there any animals (like spiders, snakes, etc) that you definitely don't like? Do you want to have a large, provide most of your own food garden? 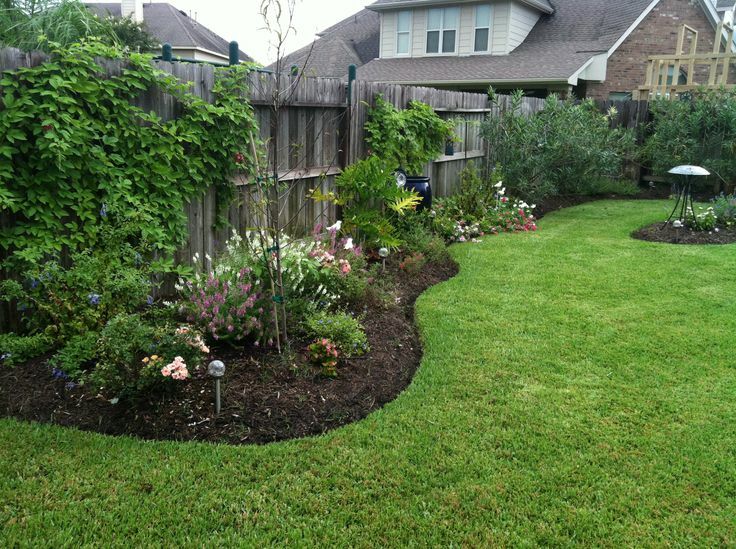 Would you prefer wooded, shrubby areas or do like open mowed areas? Do you plan to make a concrete or brick patio in the future? I know what I would do with it but that might not be what you want to do there. 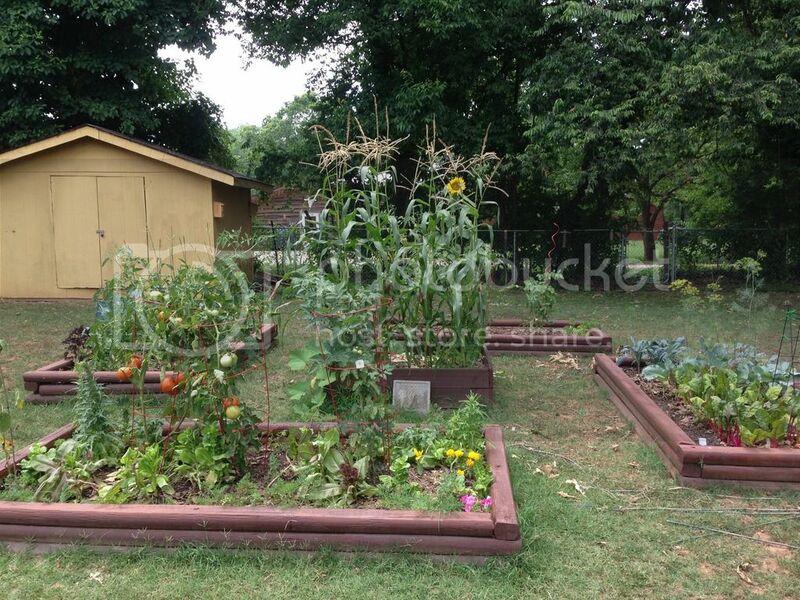 Having a vegetable garden and an outdoor recreational area would be a great idea. They can come in handy in a lot of ways.